We’ve all been there. As you get ready to go to work full of energy and all set for a productive day, you get a message from an employee saying they won’t be in for the day. Maybe it’s a legitimate illness, or maybe it’s not – but it’s fair to say the weirdest (and most entertaining) excuses for taking an MC seem to coincide with outside events, like the Formula One Grand Prix or their holiday they’re not quite ready to return from. Or perhaps, employees are just getting more creative with their bulls***. According to new survey from CareerBuilder of 3,103 workers and 2,203 hiring managers and HR professionals, 28% of employees have called in to work sick when they were feeling well. Out of these, 19% wanted to catch up on sleep, while 11% were too put off by bad weather to get out of bed. 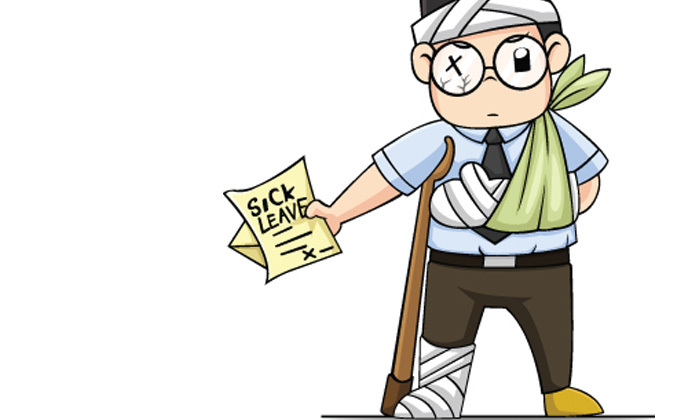 December was also highlighted in the survey the most popular time of year for employees to call in sick, according to 21% of employers, followed by January (17%) and February (14%). 7. Employee got stuck in the blood pressure machine at the grocery store and couldn’t get out. Though the majority of employers give their employees the benefit of the doubt when they called in sick, the survey found 31% of bosses have also checked to see if an employee was telling the truth in one way or another. Asking to see a doctor’s note was the most popular way to find out if the absence was legit (66%), followed by calling the employee (49%). As many as 15% of employers went the extra mile (quite literally) and drove past the employee’s house. But not all the above excuses are always false though. Check out a few outrageous MC excuses that are actually true.